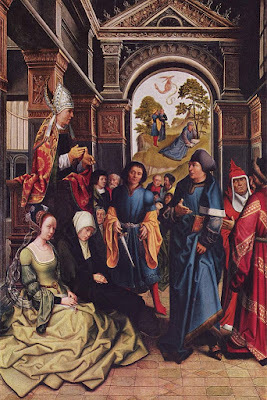 This article is mostly the work of our Ambrosian writer Nicola de’ Grandi; I translated it from Italian, and added the paragraphs on the Ambrosian arrangement of the Sundays after Pentecost, and the Roman Rite’s use of the pericope of the adulteress. In the Ambrosian Rite, there are only fifteen Sundays formally named “after Pentecost”, and if Pentecost is very late, as few as eleven may be actually celebrated. 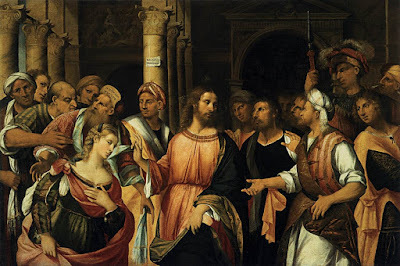 The series is interrupted by the Sundays “after the Beheading of John the Baptist,” of which there may be four or five, followed by the first and second Sundays of October. On the third Sunday, the church of Milan commemorates the dedication of its cathedral, followed by three Sundays “after the Dedication.” The largest possible number of Sundays after Pentecost is therefore 26, whereas it is 28 in the Roman Rite, since the Ambrosian Advent begins two weeks earlier, on the Sunday following St Martin’s day. This past Sunday, the second of October, is named in the most ancient Ambrosian missals “the Sunday before the Dedication,” or else “before the Transmigration of the church.” Until the middle of the 16th century, the city of Milan had two cathedrals, on either end of the great modern Piazza del Duomo. The second title, “ante Transmigrationem Ecclesiae”, refers to an ancient tradition, attested in the 12th century Ambrosian Ordo of Beroldus, that placed on the Sunday of the Dedication one of the liturgical year’s most solemn events. All of the liturgical furnishings and books were taken in a grand procession, led by the archbishop, from one of the two cathedrals, in this case the “summer church” dedicated to St Thecla, to the “winter church”, dedicated to the Virgin Mary. The other such occasion was no less than Easter itself, on which the procession was reversed. 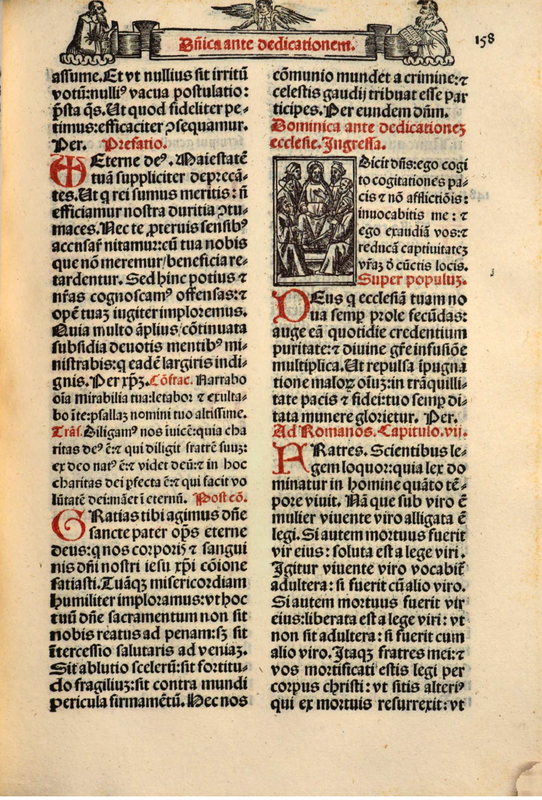 A page of an Ambrosian Missal printed in 1522; the Mass of the Sunday before the Dedication. The Gospel of the second Sunday of October is John 8, 1-11, the famous “wandering pericope” of the woman taken in adultery. This passage occupies a uniquely important place in the Ambrosian tradition, since it is attested, together with three others, in the most ancient source directly related to the rite, the Codex Sangallenis, sometimes called the “king of palimpsests.” (A palimpsest, from the Greek for “scraped again”, is a manuscript whose original writing has been scraped off so that the paper or parchment can be reused. In many cases, the original writing can be recovered; several palimpsests are valuable witnesses to certain ancient texts.) A portion of this extraordinary codex, which is kept in the library of the monastery of San Gallen in Switzerland. contains what the most recent scholarship considers to be the remains of an ancient Ambrosian “libellus missarum,” (small book of Masses), dating back to the 7th century. What makes this a witness of such exceptional importance is that St Ambrose comments upon the same passage in the so-called “Second Apology for King David,” a stenographer’s record of sermons which he preached over two or three days in the year 388. At the very beginning, he says “The reading of the Gospel … in which you heard of the adulteress brought before Christ, and sent away without condemnation … (Apol. David altera 1,1). St Ambrose creates a parallel between the David’s adultery with Bathsheba, in which he sees a prefiguration of Christ’s love for the Church, and the adultery of the sinful woman justified by Christ. He justified the adulteress of many husbands, as he says, because she is a figure of the Church, (in the broader sense of God’s people, in the Old and New Testaments) that sought the Word of God in many places until she found it in Christ, and was absolved and purified by Him. The ecclesiological interpretation which St Ambrose gives to this passage is also suggested by its placement in the traditional Roman lectionary, on the Saturday of the third week of Lent. The Epistle at that Mass is the longest in the entire Missal, the story of Susanna (Daniel 13), who already in the early third century was seen as a symbol of the Church, and the two elders who wish to seduce her as a symbol of Church’s persecutors. Susanna, therefore, is the symbol of the Church in her fidelity to Christ, and the adulteress of the Church redeemed by Christ when she has been unfaithful to him. But even more noteworthy is the fact that St Ambrose, as he continues his preaching, then cites the Gospel passage John 10, 22-30, in which Christ pronounces the words “I and the Father are one”, which the Ambrosian Missal assigns the following Sunday of the Dedication of the Church. This episode takes place during the Jewish feast of the dedication of the temple in Jerusalem, known in Greek as “Encænia – the renewal.” As St Ambrose explains it, “What belongs to the nature of divinity is set forth in the reading of the Gospel, which you have devoutly followed, when you heard read out the word of the Son of God, ‘I and the Father are one.’ ” The same passages, with the same interpretation, and similarly placed next to each other, are therefore found in the writings of St Ambrose himself, before the long gap in the written sources after the 4th century, only to reappear after this long silence in the 7th century “libellus” contained within the codex at San Gallen. 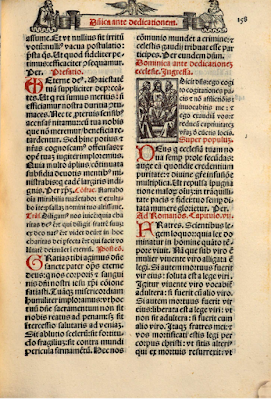 This forms an exceptional witness to the Milanese church’s ability to jealously guard and preserve not only the essential characteristics of its own order of readings, but also the traditional interpretation of the scriptural passages contained therein, even over the course of the centuries from which no written liturgical source survives.